Dimensions: 8-1/2 x 10-1/2 in. 36 pages. For ages 4-8. Paperback. Take one candy machine, one nutty inventor, one handyman, and one rubber duck. Mix well with chocolate and Ohhhhhhh, Ducky! 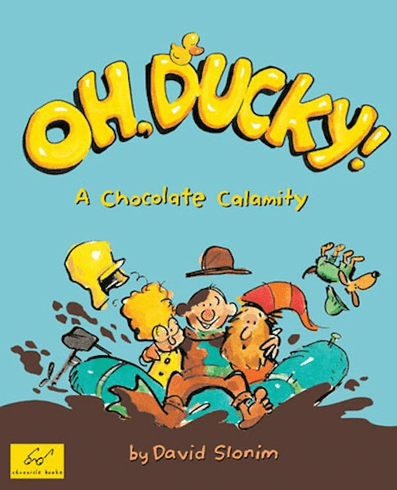 you have one delicious adventure.When a rubber duck gets stuck in the chocolate-making machine, Mr. Peters dons his diving suit to investigate the pipes and swims through chocolate sharks, ships and sea chests to save the day. Children and grown-ups, too will find David Slonim's wacky story and goofy characters irresistible.